Toms Creek is an interesting freestone stream that flows through the heart of Blacksburg to the New River at Whitethorne. Unlike most of the mountain streams that you will find in the New River Valley area this stream flows through farmland resembling more of a spring fed stream. 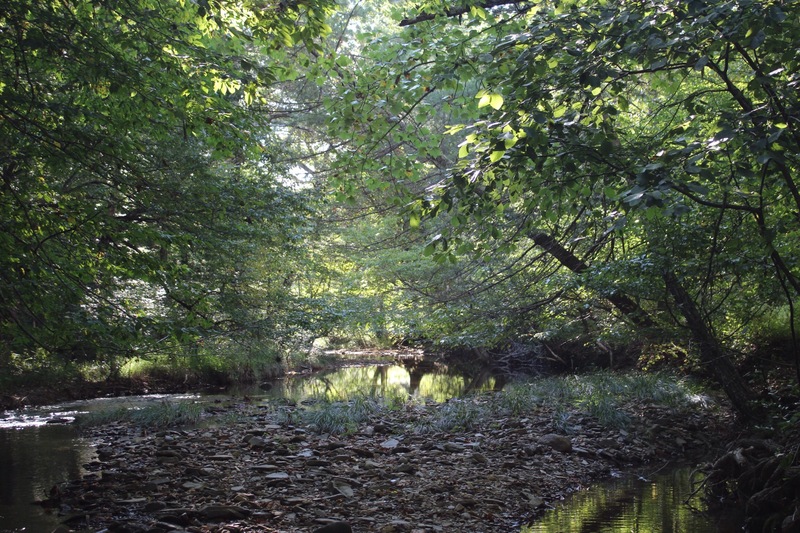 Because a majority of the land that Toms Creek flows through is private property the state of Virginia only stocks the tail end sections; stocking starts just north of the where Toms Creek joins with Poverty Creek going to its end at the New River. While I feel at home fishing the narrow mountain sections of Toms Creek fishing the areas that flow through the farm fields are what makes Toms Creek so enjoyable. There is nothing in this world that brings me more adrenaline than those seconds right after a large trout smashes a hopper, those seconds are what keeps this sport so addictive. My usual plan of attack for Toms Creek is to start at Whitethorne and work my way towards the Poverty Creek Junction. I will throw hoppers, streamers, and dry flies until it starts becoming more mountainous, and then I will switch to strictly nymphs. When the stream gets murky, account of rainfall, switch to flashy nymphs with hot spots and blood worms to produce trout. This stream is very popular for local spin fishermen, be prepared to have deal with the stream being crowded. However during the fall you can combat this pretty easily by going fishing on a Saturday when there is a home football game at Virginia Tech. Stick only to the areas that have the Virginia Stocked Trout signs unless you have permission from the land owners. There is one section that you can fish that has gated access, make sure you close the gate behind you because there are cattle in this area. Take Prices Fork Rd heading west towards Radford. Turn Right on to State Rte. 652, McCoy Road. Follow this road for 3.5 miles and turn right on to Mt. Zion Road. Toms Creek will be you cross over at the first bridge you come to. To get to the Poverty Creek Junction area follow Mt. Zion Rd 2.1 miles and turn left on to Poverty Creek Rd. Follow this road until you go over a bridge that goes over Toms Creek (there is a parking area just beyond this bridge). If this stream would hold a good and constant water level year round it would contend with Little Stony Creek (Giles County) as being one of the prettiest streams in the New River Valley. Sadly it doesn’t. Poverty Creek which flows down the westward valley between Brush and Sinking Creek Mountain from Pandapas Pond to Toms Creek is a stream that is dependent on the overflow water from Pandapas Pond. 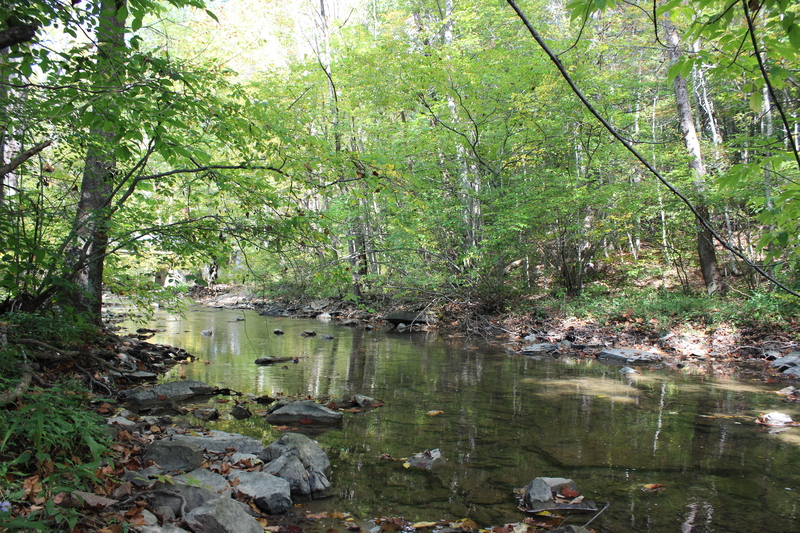 During the summer and early fall the water level is so minimum that it makes Poverty Creek unfishable for trout. 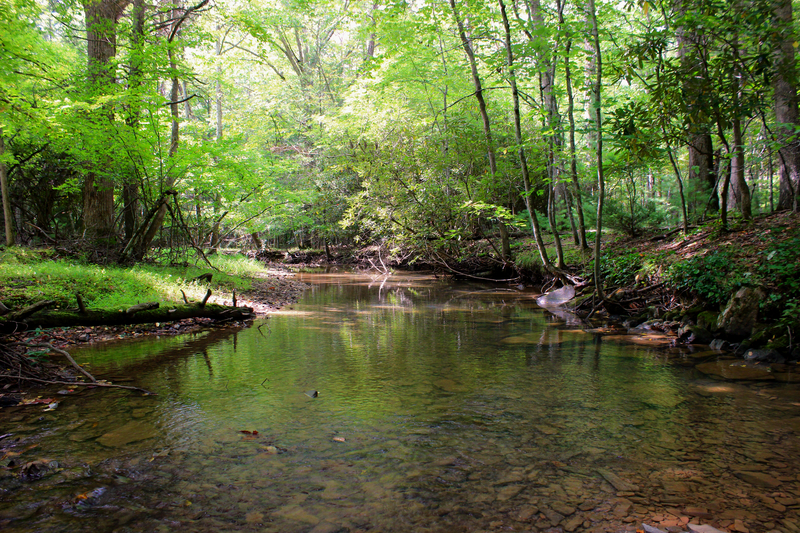 However during later winter and early spring Poverty Creek perks back up making it a good fly fishing destination if you don’t want to deal with the crowds hiking Little Stony Creek. There are several different ways to get to Poverty Creek; you can park at Pandapas Pond and follow Poverty Creek trail which is right beside the stream or you can take the Forest Service Road 708 that is just past Pandapas Pond before you get to Giles County. I prefer using the Forest Service Road; starting at the Virginia Trout Stocking sign just below the second mile marker and fishing up the trail going towards Pandapas Pond. 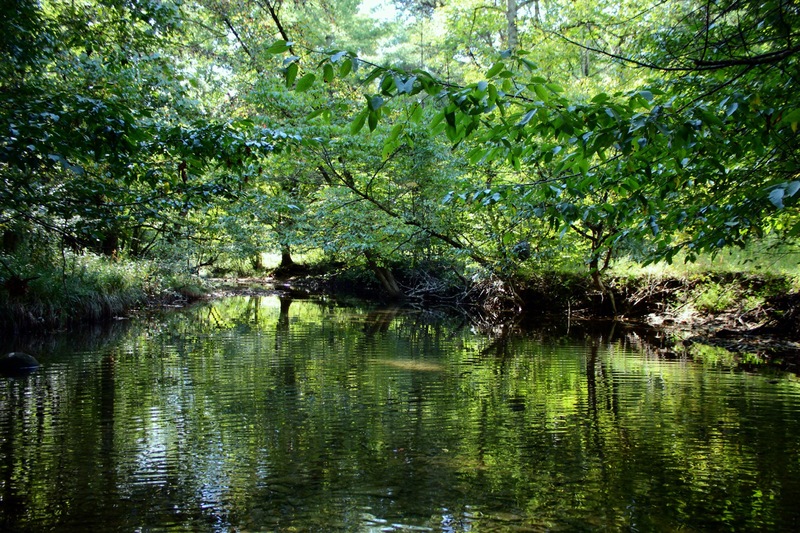 When fishing this stream make sure you are using lighter nymphs or dry flies, heavy nymphs will snag constantly on fallen tree limbs and rocks. Personally I use small soft hackles, zebra midges, and callibaetis nymphs for this stream. This stream is a part of the Poverty Creek Trail System, expect to see hikers and runners on these trails throughout the year. If you are going to use the Forest Service Road 708 during the winter I suggest you travel in an all-wheel drive or 4-wheel drive vehicle, this road can be pretty treacherous. Also because you will be in the Jefferson National Forest during hunting season I suggest you always wear some type of blaze orange or bright colored clothing just in case of hunters. Pandapas Pond Entrance: Take US-460 West towards Pembroke. Then turn left onto Forest Service Rd 808 (entrance to Pandapas Pond). The first Parking area will be on your left as you turn onto this road and the second parking area will be the area where the road dead ends. 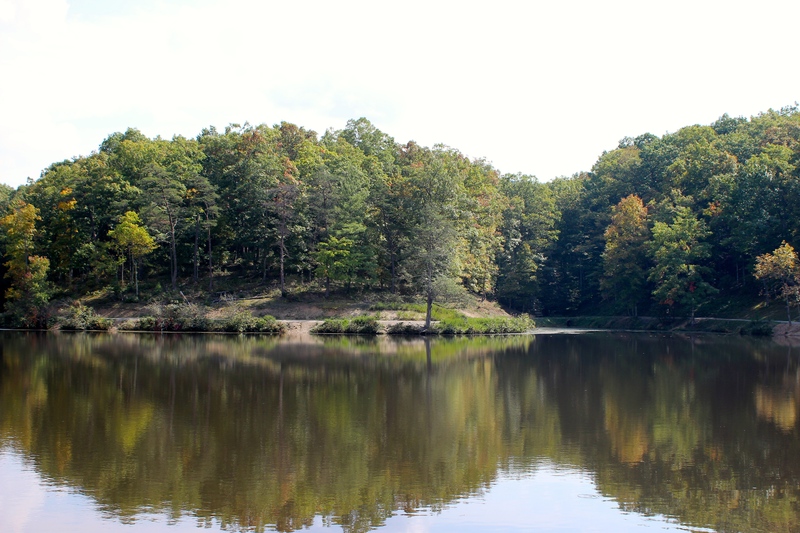 Poverty Creek will be located on the west side of Pandapas Pond and you will see a Virginia State Stocking Sign here. Forest Service Road 708: Take US-460 West towards Pembroke. Then turn left onto Forest Service Rd 708. Follow this road until you see the Virginia State Stocking sign on your left located roughly 2.1 miles from your initial turnoff. Whoever named Pandapas Pond must have liked the way the two words roll off the tongue because Pandapas is not a Pond but a small lake. 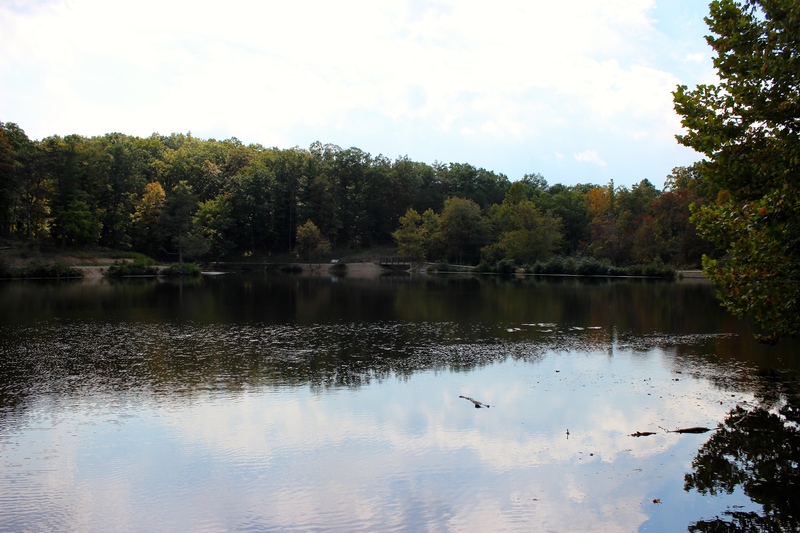 This manmade 8 acre pond is located minutes away from downtown Blacksburg between Sinking Creek Mountain and Brush Mountain in the Jefferson National Forest. Known to local residents for its beautiful scenery, wildlife, and its hiking trails; this is a great place for those of all ages looking for still water fishing in the New River Valley. While Pandapas Pond holds a variety of species of fish year round, the state of Virginia stocks it heavily between October and May with rainbow and brook trout. Fly fishing from the banks here can be a bit awkward unless you have a spey rod. This is due to the high volume of people walking on the trail around Pandapas Pond, if you don’t check each and every back cast you will hook someone. Furthermore don’t even attempt to wade out into the pond either, you will find yourself in water above your head just after a few steps from the bank. Without a float tube I wouldn’t even recommend Pandapas Pond to fly fishermen, just bring a spin rod. However if you are able to get out into the pond you will find yourself with the chance to catch citation size trout in seconds. My favorite flies for this pond are chironomids, blood worms, and weighted wooly buggers, you will want these flies to sink deep to get to the bigger trout. 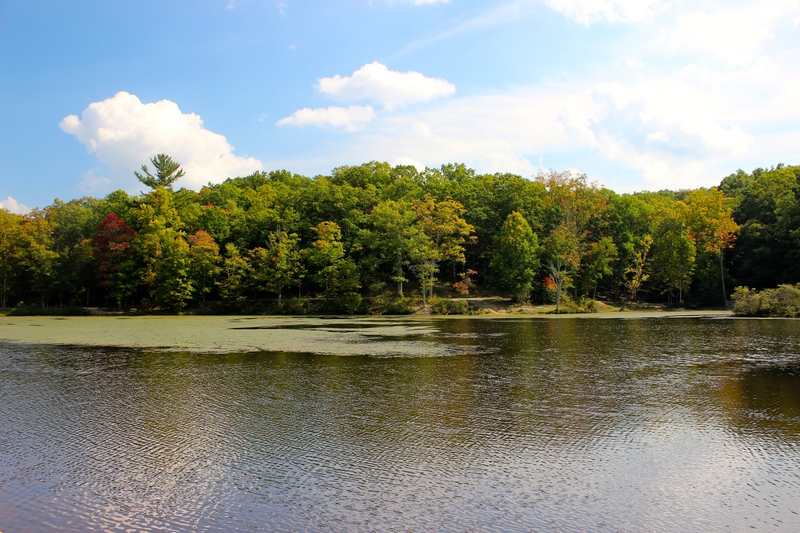 Pandapas Pond is open to the public from sunrise to sunset each and every day. There are two free parking areas; both will requires a short hike however the second parking lot is handicapped accessible. The gates leading to the pond does blocks people from launching a larger boat, make sure if you bring an inflatable that you can carry it for more than 50 yards. Take US-460 West towards Pembroke. Then turn left onto Forest Service Rd 808 (entrance to Pandapas Pond). The first Parking area will be on your left as you turn onto this road and the second parking area will be the area where the road dead ends. Casting: Back Casting should not be a problem if using a smaller rod, however if youre using a larger rod expect to have to roll cast. When Craig Creek is stocked this stream is extremely popular for both spin and fly fishermen. 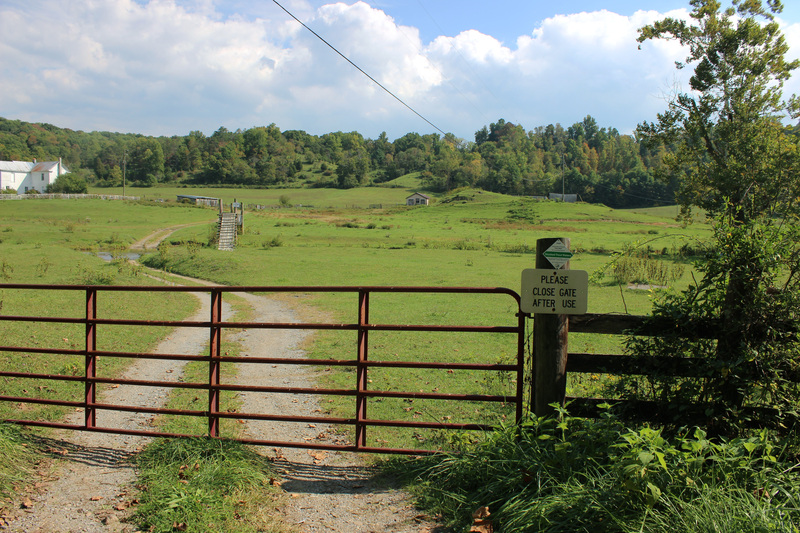 Located 20 minutes away from Blacksburg, Craig Creek is a traditional freestone mountain creek in the Jefferson National Forest, lying in the valley between Brush Mountain and Sinking Creek Mountain. Unfortunately this stream suffers from one big issue; low water. For years this stream has been on the State of Virginia’s NSF list and has just recently been removed. Because of the water levels there are very few holdovers that survive the summer months, plan on coming here only a stocking. Don’t expect to find big splash pools or fast moving water on Craig Creek either, what you are going to find is clear large flats followed by shallow riffles. Dry fly fishermen will need to find an attractor fly that the stocked fish are keying up on that day, I like using Royal Wullfs and Yellow Stimulators on this stream. 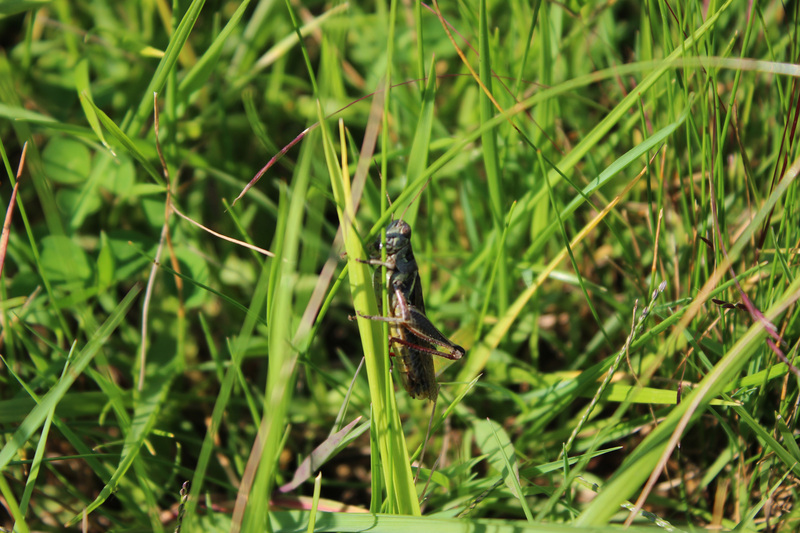 Hoppers can be used during the fall when you are in the Caldwell Fields area. When nymphing stick to single nymphs or non-weighted multi nymph rigs, I honestly prefer using a Caddis/Dropper combination, but when strictly nymphing I will use a zebra midge as my top nymph and a jig soft hackle or a small bead head prince as my second nymph. Do not use large suspension devices such as thingamabobbers; instead try yarn strike indicators or a small ball of biostrike. There are a few deep holes that make streamers a good choice; you will find these holes on Craig Creek located along the roots of tree banks and near fallen logs. Because of Craig Creek’s distance from Blacksburg expect a high turnout in the number of anglers fishing here after a stocking. There are numerous pull off points and parking areas along Craig Creek Road, just make sure you pull completely off the road because it is only a single lane dirt road. Also remember that you will be in the National Forest during hunting season, wearing some type of blaze orange is very wise choice. Take US-460 West towards Pandapas Pond. Turn right onto Craig Creek Rd (VA-621), follow road for 8 miles till you see the first state stocking sign.